We deliver to the following location: Alor Setar, Bandar Sri Damansara, Banting, Batu Pahat, Bentong, Bintulu, Butterworth, Ipoh, Jalan Ipoh, Johor Bharu, Kajang, Kemaman, Klang, Kluang, Kota Bharu, Kuala Kangsar, Kuala Lumpur, Kuala Terengganu, Kuantan, Kuching, Labuan, Lahad Datu, Melaka, Mentakab, Miri, Muar, Nilai, Penang, Port Klang, Rawang, Sandakan, Segamat, Seremban, Sibu, Sitiawan, Sungai Petani, Taiping, Tapah, Tawau, Teluk Intan, Temerloh, and Singapore. Our Solar Fountain Pump Kit allows you to create small waterfalls, fountains, or any other indoor or outdoor water feature you can think of. This highly efficient pump is compact, submersible and offered exclusively by SC Origin. 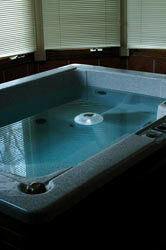 The pump produces flow rates of 30-45 gallons per hour and can raise water up to 2 feet within a tube. 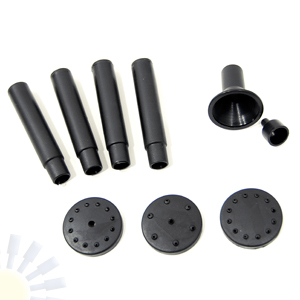 The kit includes 3 fountain head attachments for creating decorative spray patterns and can be connected to any flexible PVC tubing with an inside diameter of 3/8" (not included). 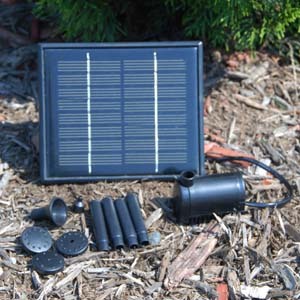 6V Solar Brushless Pump with LEDS and timer: The 6V Pump with LEDs and timer is one of our newest solar pumps. It is also one of our most unique products to date! The 6V pump system is combined with a battery pack and white LEDs that will light up your fountain at night. The LED lights are located on a ring which is connected to the battery pack and the battery pack automatically turns the lights on at nightfall. 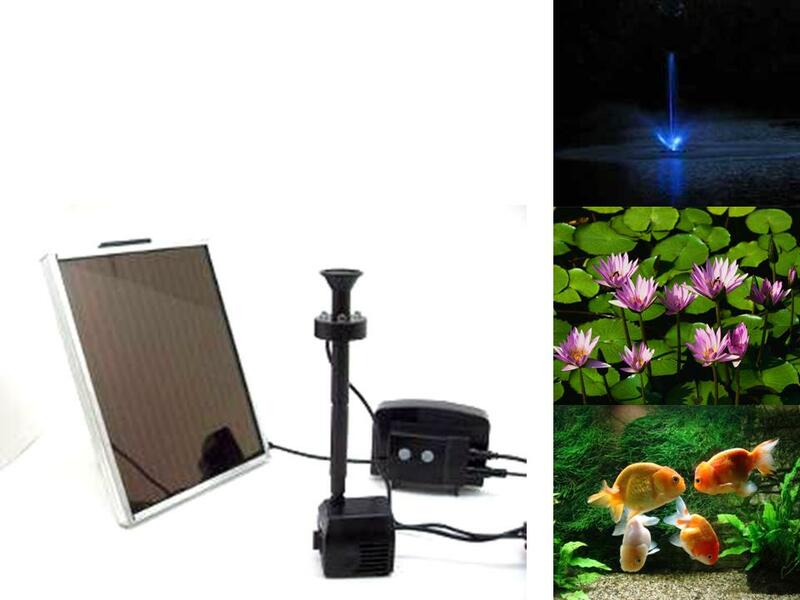 Add a 6V Solar Pump with LEDs to your water feature and watch the night fountain atmosphere of you outdoor living space. The battery pack also allows you to turn the pump on or off with a convenient switch which is located on the battery pack. By push the "on" buttom, the pump and LED lights will keep running for 3 hours and shut off automatically; The pump will begin operation automatically at the same time every day. Using the latest brushless motor technology, which is reliable, maintenance-free and has no failure-prone carbon brush. 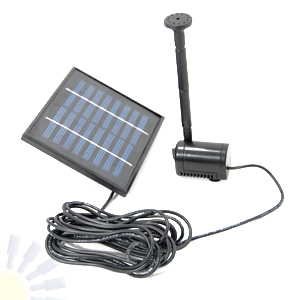 See the solar fountain pump in action on . 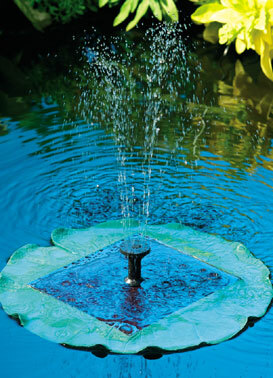 Our Solar Floating Lilly Fountain is the next generation in solar technology. With this fountain, you have the ability to control when you want your fountain to operate with the simple press of a button on a hand-held remote control. This proprietary design utilizes a single crystalline solar panel to power the lily fountain during the day while charging the rechargeable batteries at the same time. The Solar Lilly Fountain is both beautiful and completely sustainable! Immediately, the fountain can operate for up to 90 minutes at night. Three fountain heads are included, so you have the versatility of three different spray patterns! The powerful submersible pump displaces water up to 45 GPH and up to 20" high with no assembly required! Enjoy the relaxing sound of running water in your garden without worrying about electrical connections or adding to your electric bill! It also come with LED lights for night fountain display! 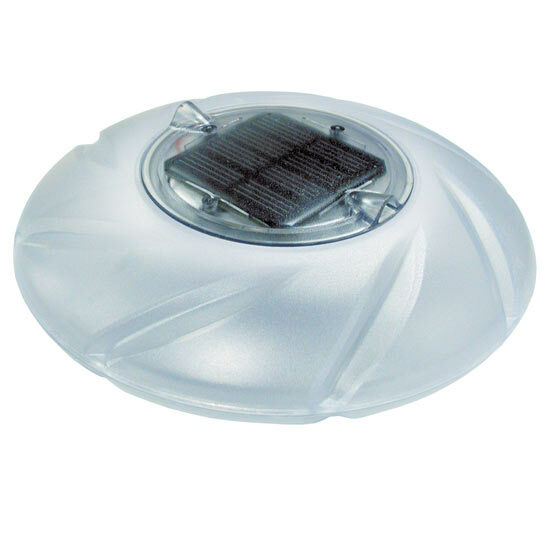 The Solar Floating Pool & Spa Light from SC Origin is a modern styled floating solar light that is the perfect accent for pools, ponds, waterfountains, and other landscape water features of all shapes and sizes. If your tastes stray from the ordinary into the extraordinary, but you want the benefit of solar accent lighting, it is made for you. Weighing just one pound, and a with a large 8" diameter, the Solar Floating Pool & Spa Light will grab the attention to your landscape water features you crave without breaking the bank or adding a cheap, tacky feel like some other Floating Solar Lights.